NEW!!! Bookings are now live for 19'20. Looking for accommodation for September '19 ? Now's the time to book your accommodation in Edinburgh. Secure your studio apartment today at our perfectly located Edinburgh student accommodation with a residents-only gym and private cinema for September 2019. From inspired social spaces to state-of-the-art security, Collegiate offer unparalleled student accommodation. From meeting new people to making lifelong friends, this is limited edition student living. Book today, limited availability remaining! Viewings available on demand. Set in a quiet and elegant enclave, our strikingly contemporary studio, one, two and three bedroomed apartments are ideal for a modern student lifestyle. Within walking distance of all the main colleges and university campuses and offering easy access to transport links, this really is Edinburgh student living at its finest. Our student apartments all come with flat-screen TV’s, double beds, contemporary high-gloss kitchens, individual en-suite facilities and generous study and storage space. You bring the pop-corn and we'll supply the cinema – recline in style in our in-house cinema for one of our movie nights. With the latest, state-of-the-art, high quality audio visual equipment, including a large screen and Blu Ray DVD player, there really is no need to leave the comfort of your student home! Gateway Apartments offers quiet study areas in our reading and work rooms for when you need a change of scene – or they are ideal for studying with friends or in a group. The rooms are all are equipped at TV, Wi-Fi, desks and chairs. Make sure it's not all study and no play by taking time out to relax in our games and common room. Try your hand at a game of giant jenga or table football – or simply curl up on the comfy sofas for a catch-up and a cup of tea with friends. To help you reach your maximum fitness, our gym is stocked with the latest exercise equipment, with all the convenience of it being literally on the doorstep of your student apartment. The gym facilities are exclusively available to students staying at Gateway Apartments – so make the most of it! Wi-Fi and high speed broadband is available throughout the Gateway Apartment building, 24 hours a day. Wired connections are available direct to your room via an Ethernet cable. You can also watch digital TV via broadband, with over 50 digital Freeview TV and radio channels – upgrade options are available up to 100Mb/s. You can sleep easy at night knowing we've taken every step to ensure your the safety and security of our student accommodation. From secure electronic access and on-site management to 24-hour helpline and CCTV – and for added peace of mind, our accommodation is accredited by ANUK, the rented accommodation standards body. Gateway Apartments is a premier student residence in an elegant, central, area of Edinburgh and a convenient walk from Edinburgh university. Offering a mix of premier studios, 1, 2 and 3 bedroom apartments, every room is bright, modern and features all the comforts you’d expect from one of the UK’s top student residences; from elegant rooms with double beds and en-suite shower rooms, to contemporary fitted kitchens and flat-screen TVs. Great central location, in the heart of the city just a short walk from the University of Edinburgh. Just 5 minutes from the local supermarket, cash point and high quality bars and restaurants this is the ideal setting for any student. Transport links are great with bus stops just outside and only a 5 minute walk from the train station. Your first weeks rent is now on us and sharing with a partner won't cost you anything extra! 2 bed premier en-suite rooms are in cluster apartments of 2. Each bedroom has an en-suite bathroom and shares a large shared kitchen/lounge. All rooms are fully furnished with high quality built in furniture. Every room is bright, modern and features all the comforts you’d expect from one of the UK's top student residences; from elegant rooms with double beds and en-suite shower rooms, to contemporary fitted kitchens and flat-screen TVs. All utilities are included in the weekly price as is contents insurance. Classic Studios are fully furnished with high quality built in furniture. 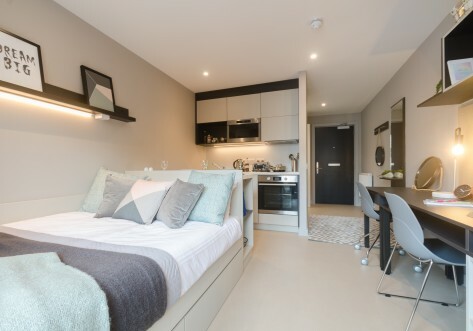 Every room is bright, modern and features all the comforts you’d expect from one of the UK's top student residences; from elegant rooms with double beds and en-suite shower rooms, to contemporary fitted kitchens and flat-screen TVs. Premier Studios are fully furnished with high quality built in furniture. 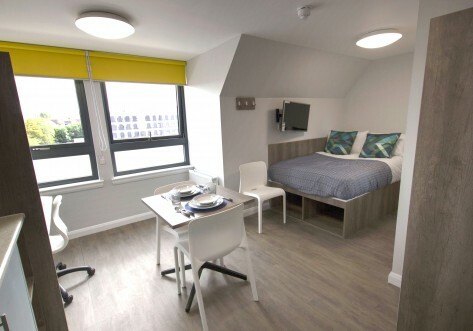 Every room is bright, modern and features all the comforts you’d expect from one of the UK's top student residences; from elegant rooms with double beds and en-suite shower rooms, to contemporary fitted kitchens and flat-screen TVs. All bills including utilities and contents insurance are included within the weekly price. The Superior Studio is the largest studio offered at Gateway Apartment. The room is spacious and has a private kitchen. 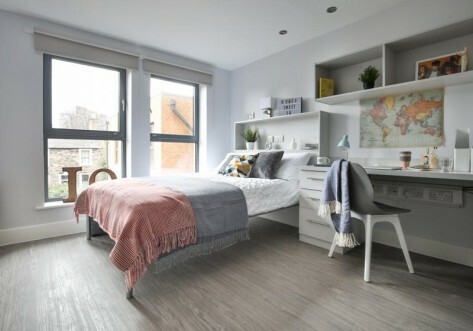 Every room is bright, modern and features all the comforts you’d expect from one of the UK's top student residences; from elegant rooms with double beds and en-suite shower rooms, to contemporary fitted kitchens and flat-screen TVs. The Superior Studio is the largest studio offered at Gateway Apartment. The room is spacious and has a private kitchen. The room also comes with a stunning view of Edinburgh. 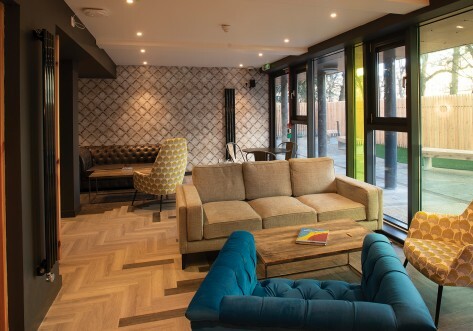 Every room is bright, modern and features all the comforts you’d expect from one of the UK's top student residences; from elegant rooms with double beds and en-suite shower rooms, to contemporary fitted kitchens and flat-screen TVs. Rooms in our Premier 3 Bed Apartments are some of our best rooms. Each bedroom has an en-suite bathroom and shares a large shared kitchen/lounge. All rooms are fully furnished with high quality built in furniture. Every room is bright, modern and features all the comforts you’d expect from one of the UK's top student residences; from elegant rooms with double beds and en-suite shower rooms, to contemporary fitted kitchens and flat-screen TVs. We are exclusively running a £200 Credit Back offer for bookings on all room types. But hurry as it's only available for the next 20 bookings! We also offer double occupancy on some of our rooms, providing the room is large enough, please enquire for more details.